A popular race for both distances, taking in both the city and countryside. A challenging 8-mile off-road (mainly woodland track) race through Woodchester Park. Single-lap route for both distances, largely flat, barring a short sharp climb for the marathon. Takes in the city sights with some canal path section. An undulating 7.2-mile race, over three laps around Minchinhampton Common. Free beer for finishers. An undulating but nonetheless popular 10k, refreshments and beer tent on hand. 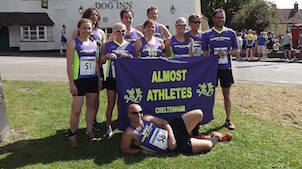 Part of the Glos AAA race series. "A tough cross country race"
The course is flat, with one steady climb at mile 8 and 9. The lap around the racecourse is on a road on the inside of the race track with stunning views across the Cotswold Hills. Multi-terrain to Neolithic long barrow Belas Knap with spectacular views. The Golf Clubhouse, Cleeve Common. Run the Badminton Horse Trial course! 1 mile flat along the runway! 20k + 480metre climb, multi-terrain Great event!! A 7 Mile offroad riverside run along the Severn River from Epney to Weir Green. A year of mud and more mud! 10K in Weston - fancy dress recommended! 1mile flat along the fully lit runway! Fun run to raise funds for Canine partners. Challenging coastal run with three distance options.